Luke 12:36 And ye yourselves like unto men that wait for their lord, when he will return from the wedding; that when he cometh and knocketh, they may open unto him immediately. 37 Blessed are those servants, whom the lord when he cometh shall find watching: verily I say unto you, that he shall gird himself, and make them to sit down to meat, and will come forth and serve them. 39 And this know, that if the good man of the house had known what hour the thief would come, he would have watched, and not have suffered his house to be broken through. 47 And that servant, which knew his lord’s will, and prepared not himself, neither did according to his will, shall be beaten with many stripes. 49 I am come to send fire on the earth; and what will I if it be already kindled? 50 But I have a baptism to be baptized with; and how am I straitened till it be accomplished! 53 The father shall be divided against the son, and the son against the father; the mother against the daughter, and the daughter against the mother; the mother in law against her daughter in law, and the daughter in law against her mother in law. 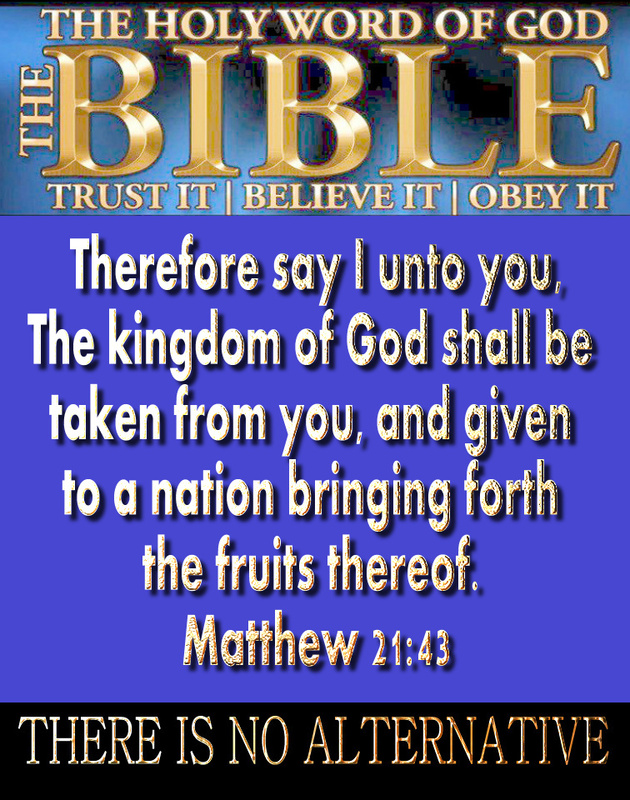 Matthew 21: 43 Therefore say I unto you, The kingdom of God shall be taken from you, and given to a nation bringing forth the fruits thereof. -The Jewish people are no longer God’s chosen people. Instead, the Christian church now makes up God’s chosen people. -In the New Testament after Pentecost, the term “Israel” and chosen now too refers to the church. -The Mosaic covenant (Exodus 20) is replaced by the new covenant (Luke 22:20). -Actual circumcision is replaced by a circumcision of the heart (Rom. 2:29). Romans 11:17-32 If some of the branches have been broken off, and you, though a wild olive shoot, have been grafted in among the others and now share in the nourishing sap from the olive root, 18 do not consider yourself to be superior to those other branches. If you do, consider this: You do not support the root, but the root supports you. 19 You will say then, “Branches were broken off so that I could be grafted in.” 20 Granted. But they were broken off because of unbelief, and you stand by faith. Do not be arrogant, but tremble. 21 For if God did not spare the natural branches, he will not spare you either. Romans 1:16 For I am not ashamed of the gospel, because it is the power of God that brings salvation to everyone who believes: first to the Jew, then to the Gentile. Colossians 3:11 Here there is no Gentile or Jew, circumcised or uncircumcised, barbarian, Scythian, slave or free, but Christ is all, and is in all. None of these above verses mentioned, can be neglected, explained away..